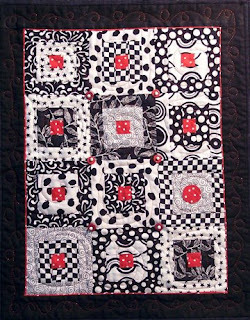 Such a classic combination, isn't it - this lovely little quilt was made by Paula for her partner. Nice job, Paula! Beautiful, I love these colours together. I love this! You oughta send it to me so I can hang it next to it's wild cousin the Blended Frog :-) Bec we all know I really cannot part with the frogs! lovely prints, and the quilting looks great in red!